This is a great series. 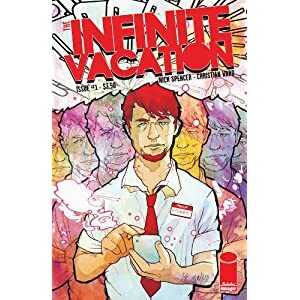 Infinite Vacation is at issue #2 – and I am totally hooked. It’s a mix of concepts that are not new; it’s got some Source Code in it and elements of time travel/split time line type stuff, etc. – but the take on it is so unique and well done that it doesn’t matter. The concept is that there are infinite versions of all of us on different timelines, but the unique element is that there’s a smartphone app in this comic’s universe that let’s people purchase the ability to be in that timeline. That’s cool stuff. The artwork is really interesting, and although it’s not always clear what is going on in some panels because of the artwork’s style, it grows on you and adds to the story. I like how it jumps from the type of art from time to time, as well. For instance there are sections where it’s real-world photos of actors in it instead of artwork, which might not sound great, but the execution is well done. I’m just sad it’s only a 5 issue run. I can see how it might not be a sustainable book over multiple issues and that’s why it’s a limited run, but it’s sad just the same.